Could a hotel possibly be more emblematic of its place? 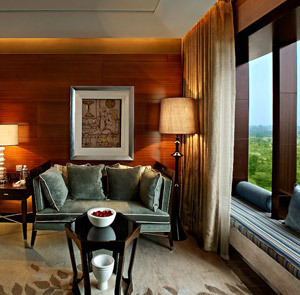 Just three miles from the new international airport, on the border between Delhi and economically booming Gurgaon, the 322-room Leela is as ambitious, as modern, as opulent and as highly functional a business hotel as you’d expect given its location — that is, if your expectations have kept pace with Gurgaon’s steroidal growth. 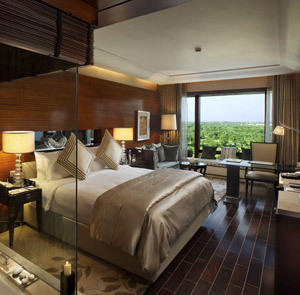 Guest rooms, by the prolific interior design firm Hirsch Bedner, are spacious and contemporary. Each one includes a large work station and thoughtful details like Bose iPod docks and laptop-sized safes with built-in chargers. All accommodations other than the Executive suite, which has views of the business district, overlook the Rajokri Nature Reserve, an unexpected expanse of quiet green in sharp contrast to the frenzy of the city. It’s a reminder that, not terribly long ago, this was a sleepy town on the way-outskirts of Delhi. Those hundreds of lavish guest rooms, views and all, are really only the beginning. There’s also a 20,000-square-foot spa, an enormous fitness room with glass walls overlooking the nature reserve, a heated outdoor pool, and enough ballrooms and board rooms and conference facilities to host a lifetime’s worth of meetings. The dining and drinking options are just as impressive. The flagship restaurant has no fewer than seven separate exhibition kitchens, another restaurant is home to a sous-chef who was formerly a Master Chef judge, and for complete gustatory overload, another still offers four guests each night a thirty-six-course Italian dinner. 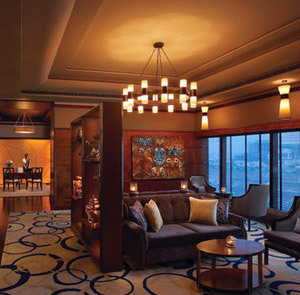 Then there’s Rubicon Bar, presently home to one of the world’s nine remaining bottles of fifty-year-aged Glenfiddich. Let’s hope you can expense it. Reservation must be cancelled 72 hours prior to the planned date of arrival. Reservations cancelled within 72 hours of the arrival date will incur a cancellation fee equivalent to one night’s accommodation charge. Vues : vue sur le jardin, vue sur la cour ou vue sur la ville.